French Impressionism captured the everyday in 19th century France, whether that was leisure time spent at the ballet, in cafés, or on the banks of the Seine. The paintings of Renoir, Monet, and Degas seldom tell stories, instead they captured moments in time, impressions. A nod to the French Impressionism Movement, Live Painting captures a moment in time on your wedding day. The style of painting itself is soft and dream-like, using short brush strokes to depict light and movement. This highlights the essence of your day, taking inspiration from the setting, colors, and feeling of the environment. Live Painting serves as entertainment at your reception, allowing guests to observe the process. Witnessing the creative process unfold, up close and personal, is part of the experience. I'm happy to let people peek over my shoulder and answer any questions they have about the painting and techniques that I use. It is up to you to decide what memories you want to turn into a masterpiece. Socializing with your guests, clinking glasses at cocktail hour or even dips on the dance floor. The people and moments that matter most to you will be artfully archived. I start painting two to three hours early to lay the foundations for your special scene. I paint throughout the reception in a setting that is easily observed. The painting is then taken back to my studio to complete touch-ups and then mailed to the bride and groom to hang in their home as an heirloom. 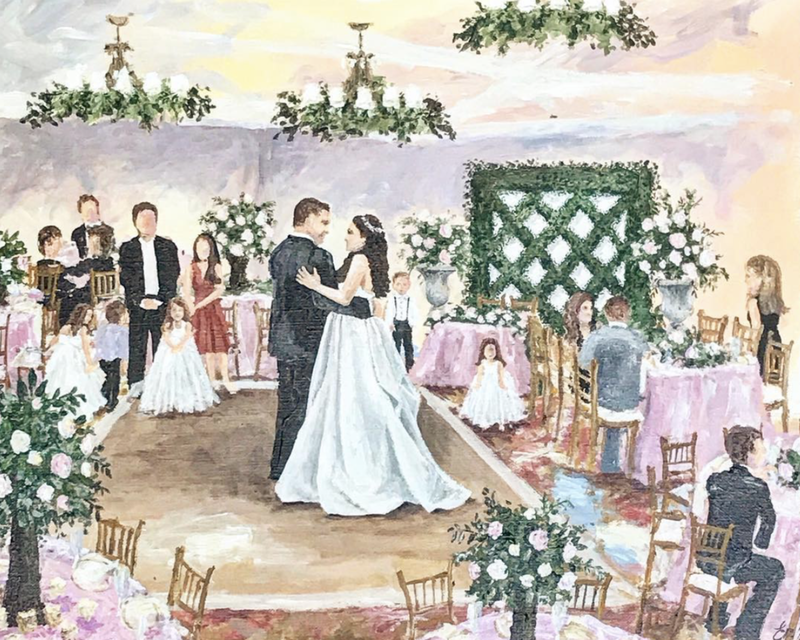 A live wedding painting not only adds an entertaining and unique touch to your wedding day, but is also a fine art investment to be treasured for generations. I take 10-12 commissions for Live Wedding Paintings per year. The demand for live event painting is quite high, so I always recommend you inquire right away if you are interested in booking. Simply send an inquiry to learn more!